Welcome to Brook Perdigon Textiles. Please take a moment to read through our FAQs before placing your order. If your question isn’t answered here, email us at info@brookperdigontextiles.com, and we’ll respond as quickly as possible. How are your fabrics made? Materials and techniques vary by product and are listed on individual product pages. 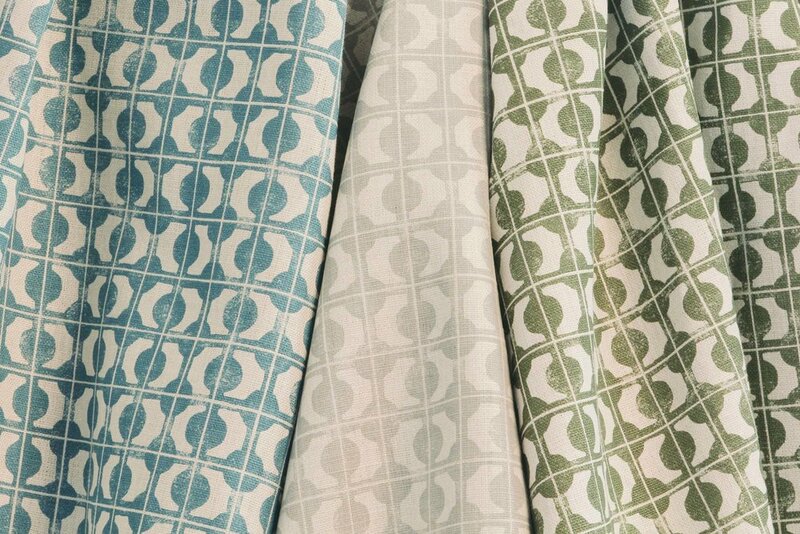 Many of our fabrics are hand-printed and, as such, contain minor variances, which are the mark of a handmade textile. Likewise, our fabrics are not guaranteed against dye variations, natural wear, stretch, shrinkage or fading. Can I order your fabrics online? Absolutely. Please note that colors and scale are displayed on-screen as accurately as possible; however, since your monitor affects your screen’s display, we cannot guarantee an exact match to the color and scale you see on-screen. Where can I see Brook Perdigon Textiles in person? You’ll find a complete list of showrooms and stockists here. If our fabrics and wallpapers are not available in a showroom in your area, please contact us directly. We are happy to send you some samples for your library. All domestic sales are shipped via USPS or UPS ground with an estimated 5-7 day delivery. Shipping is calculated by the weight and size of your item. California sales tax will be charged for all orders shipped within the state of California. Artwork + vintage furniture items will be billed separately for shipping. Please email info@brookperdigontextiles.com for a shipping quote, prior to making a purchase. All packages require a signature for delivery, unless prior arrangement is made by the client. Brook Perdigon Textiles is unable to accept responsibility for lost or stolen packages, or for costs associated with reshipment in cases where incorrect shipping information was provided. What are your lead times and terms? Lead times and terms vary by product. In-stock items ship within 5-7 days of purchase. Please email info@brookperdigontextiles.com to inquire about stock, and refer to the following breakdown for specific lead times. Our pillows + lampshades are made to order with a lead time of 3-4 weeks. When an item is in stock, rush shipping is available for an additional cost. Our collections are available for purchase by the yard. If the yardage you require is not in stock, it will be printed to order with a 5-7 week lead time. To place an order over 10 yards, please email info@brookperdigontextiles.com. For commissions, or to inquire about ordering a piece in a custom size, please email brook@brookperdigontexiles.com. Include your desired specs and the name of the artwork you’re interested in, so that Brook can generate your personalized price quote and lead time. All prints are made to order, with an estimated 4-6 week lead. Brook collects one-of-a-kind antique textiles on her travels around the globe. As with all antiques, there may be signs of wear—which are part of the piece’s storied beauty. Antique textiles ship within 5-7 days of purchase, and are not eligible for returns. All questions should be emailed to brook@brookperdigontexiles.com prior to making a purchase. Brook collects one-of-a-kind vintage furniture, and works with upholsterers to cover pieces in her signature fabrics. As with all vintage items, there may be gentle signs of wear—which are part of the piece’s storied beauty. Vintage items ship within 5-7 days of purchase, and are not eligible for returns. All questions should be emailed to brook@brookperdigontexiles.com prior to making a purchase. Any cancellation requests must be made within 24 hours of placing an order. After 24 hours, orders of any kind—including custom or stock—cannot be canceled. All sales are final, except in the case of goods received damaged. Custom items, fabric yardage, antique textiles, artwork and one-of-a-kind designs are not eligible for returns. We want you to love your items as much as we do, so please contact us with any questions or concerns prior to placing your order. To request a return due to damage, email info@brookperdigontextiles.com. Can I order fabric in custom colors? Custom colors are available with a minimum order of 30 yards. Please email brook@brookperdigontextiles.com for more information. Do you provide trade discounts? We offer a trade discount to interior designers. To establish an account, please email info@brookperdigontextiles.com and include a copy of your resale license. You’ll be asked to fill out a Resale Certificate prior to making your first purchase. Do you provide special pricing for hospitality orders? We may extend special pricing to hospitality orders, on a case-by-case basis. Please email info@brookperdigontextiles.com with the details of your project, to inquire. Do you offer CFAs (cutting-for-approval)? We are happy to offer CFAs for our in-stock fabrics. However, we are not able to offer CFAs for orders under 5 yards, or for print-to-order fabrics. Can I rush a CFA? If you would like your CFA sooner than the standard 5-7 days, please email info@brookperdigontextiles.com to discuss. Your Fed Ex or UPS account number will need to be provided in order to RUSH your CFA. Is there a minimum order amount for fabric yardage? Yes. We have a 3-yard minimum for any order. Fabric can be purchase in less than 3 yard pieces for an additional $30 handling fee. The products and content displayed on this website are the property of Brook Perdigon Textiles. Nothing in these Terms & Conditions shall be construed as granting any license or right to use any trademark, logo, product, content or service without express permission.